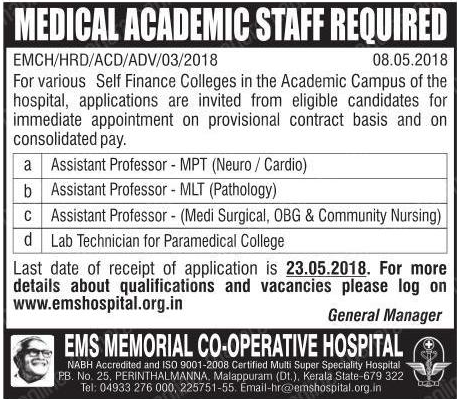 EMS Memorial Co-Operative Hospital, Malappuram has advertised in Malayala Manorama newspaper for the recruitment of Assistant Professor jobs vacancies. Interested and eligible job aspirants are requested to apply with in 23rd May 2018. Check out further more details below. About College: E.M.S. Memorial Co-operative Hospital & Research Centre Ltd named after the legendary E M Sankaran Namboothiripad (1909 – 1998) also popularly known as E M S is widely recognized as the "hospital for people" in Kerala. It is primarily backed by the philosophy and dedication of E M S, who devoted himself for the service of humanity and elevating the poor and laymen in Kerala.